In March 2017, one of my wife’s friends had to get rid of some clutter. This clutter consisted of a PowerBook G4, PowerBook G3 Pismo and an iMac G3. 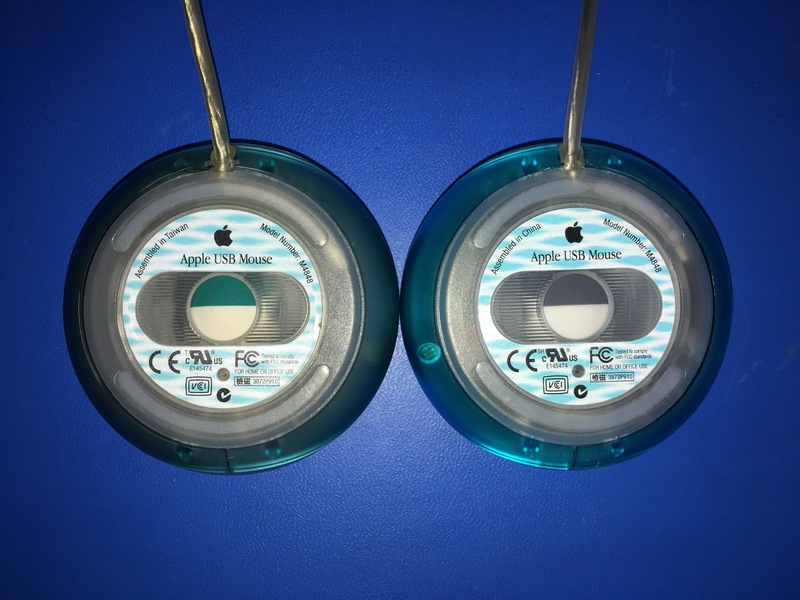 With the iMac G3 came, of course, an Apple USB Mouse or as it’s better known: a puck. A blue one in this case. It’s no secret I love these pucks but holding and using one again (I connected it and used it for a few days) my love was rekindled. So much so that I decided I wanted all of them. A year and two days later, I have all of them. Bondi Blue, Blueberry, Graphite, Strawberry, Lime, Tangerine and Grape. I managed to get each mouse meeting all of those criteria, except the Grape, which I paid $15 for. 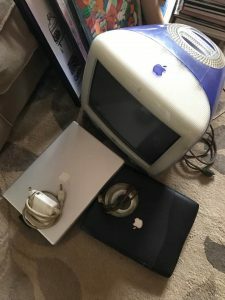 The Bondi Blue puck was easy to find, those things are everywhere as the first iMac (1998) sold like crazy. However differentiating between a Bondi Blue and Blueberry puck when searching for them online can be tricky. Those that have one to sell and are not familiar with the differences will simply search for “blue apple mouse” or “imac mouse” on ebay, see the first blue Apple mouse that pops up and adopt the name. This often results as Bondi Blue mice being listed as Blueberries and vice versa. The quality of photos in most listings is often also lacking which doesn’t help. After all, it’s just a $15-20 mouse, why spend more than 5 seconds staging a photo shoot. Lighting and angle are very important with these two color varieties. Here are a Bondi Blue and Blueberry side by side. It took a bit of fiddling with lighting and exposure to get the colors right. On the left: Bondi Blue, on the right: Blueberry. Just browse eBay for a bit and search for both colors, you’ll see vastly different shades of blue with every listing, making it hard to tell if the listing is actually what it claims to be. Another feature one can look for to differentiate is the notch in the mouse button. The Bondi Blue doesn’t have it, all the other ones do. Apple did release pucks in all colors without the notch in the button in 1999 with the first “5 Flavors” iMacs but quickly replaced them with the notched versions. The pucks without notches are so rare, might as well ignore their existence for this example. In my photo you will see the notch in the Blueberry button if you pay attention but it’s not obvious. Imagine most photos you see on eBay, you have to get lucky to find that notch. Another difference is the ball. The Bondi Blue have a white/gray ball and the Blueberry (and rest of the colors) have a white/blue ball. Left: Blueberry, on the right: Bondi Blue. If you are hunting for either or both, pay attention to these things so you end up with the right one. They are both very common to find as the 1998 Bondi Blue iMac was incredibly popular and the Blueberry was not only the most popular 1999 iMac, the Blueberry puck also shipped with the Power Macintosh G3 (Blue and White). As easy to find as the Blueberry as those are the two colors that were most sold. The Graphite puck came with the iMac G3 DV Special Edition (slot loading) and Power Mac G4 Yikes and Sawtooth. Finding one of these for a few bucks and in good shape poses little to no trouble at all. These are much harder to find, at least meeting my criteria. While Strawberry was a popular choice for women at the time, the amount of men buying these things VS the amount of women was heavily leaning towards the men. As such pink (because nobody called it Strawberry at the time, or since) iMacs were not the bestsellers and therefore not a lot of Strawberry pucks got out into the world compared to the graphite and Blueberry for example. I first found the Strawberry for $15 and was going to just spend the extra $5 as it was pretty hard to find but found one for $10 a few days later. Lime and Tangerine pucks look nice but the iMacs just didn’t look great in those colors. I don’t know anyone personally that liked those colors back in the day or since. 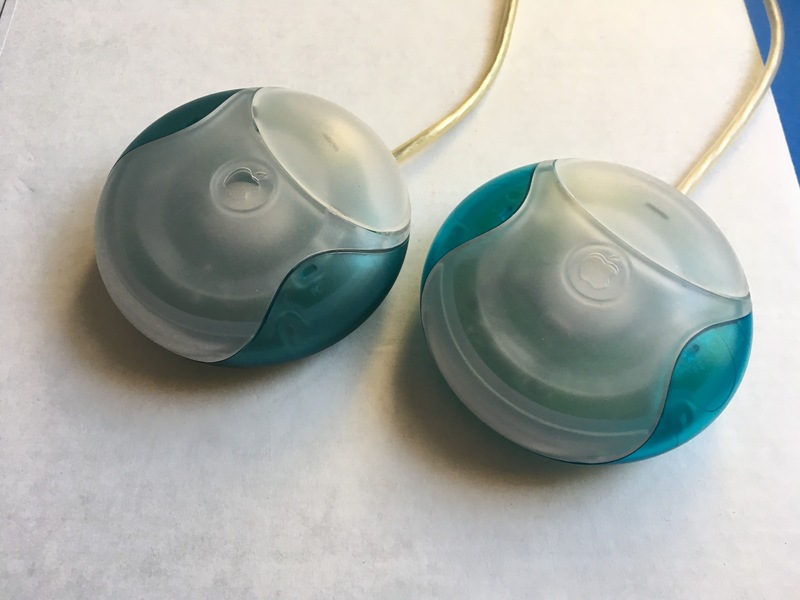 The color scheme of the 2000 iMacs (Indigo, Ruby, Sage, Snow and Graphite) were much more appealing but by then iMacs shipped with the Pro Mouse and the puck was discontinued. From what I’ve seen over the years there are more Lime iMacs floating around online than Tangerine ones so Lime pucks should be a bit easier to find. I don’t know if these were the least sold model or if these are the most popular for collectors but finding a Grape puck was not easy! The purple iMacs may have been favored more by women than men and therefore were not sold as much just like the Strawberry, who knows, just a guess. I ended up paying $15 for this one and it needed some serious cleaning but otherwise met all my criteria. They have all been thoroughly cleaned but will receive another round of super-detailed cleaning in the future. Hey… My 84-year-old mother really, really REALLY loves her Bondi-blue hockey puck. Long after her Bondi blue iMac was no more she still uses it. Our problem is figuring out how to open it to clean the rollers inside. Do you have any tips for cleaning them? Everywhere I look it’s either presumed that everyone knows this, or that it’s of no interest to anyone twenty years on. Hi Brian, That’s awesome! Glad there are some that appreciate the puck in all age ranges 🙂 Cleaning the puck is very straightforward but because it’s fun to talk about the puck, I’ll do a little writeup about it tonight or tomorrow!